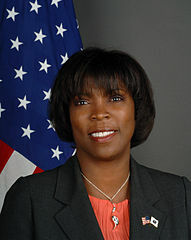 Ertharin Cousin, '79 LAS, scheduled to become director in April 2012. Ertharin Cousin has been named executive director of the World Food Program, an under secretary-general level position at the United Nations. She succeeds Josette Sheeran, who ran the program for five years. Cousin is the U.S. representative to the U.N. Agencies for Food and Agriculture, working in the global fight to end hunger and malnutrition and for the advancement of the Millennium Development Goals, particularly those dealing with food security and environmental sustainability. She has more than 25 years of national and international corporate, nonprofit and government leadership experience, including as president of The Polk Street Group, a national public affairs firm in Illinois. There, she led several projects related to strategic partnership development, external communications and philanthropy.